Wool is the fibrous covering from sheep and is by far the most important animal fiber used in textiles. It appears to have been the earliest fiber to be spun and woven into cloth. Wool is a fiber, or modified hair, that grows from the skin of sheep. Because it is formed as a living substance, its growth is regulated by the inherited characteristics of the sheep and by the general condition of the sheep producing it. Wool is a versatile product in demand mainly because of its physical characteristics that directly influence wearer comfort, processing performance, durability, and textile attributes. The use of wool as a textile fiber dates back to 4000 B.C. when it was used as such by the Babylonians. Its unique physical and chemical characteristics have been responsible for its great versatility and high value in the manufacture of clothing. Wool is the fibrous covering from sheep and is by far the most important animal fiber used in textiles. It appears to have been the earliest fiber to be spun and woven into cloth. Wool belongs to a family of proteins, the keratins, that also includes hair and other types of animal protective tissues such as horn, nails, feathers, beaks, and outer skin layers. The relative importance of wool as a textile fiber has declined over the past decades with the increasing use of synthetic fibers for textile products. The principal characteristics of clean wool types are an average diameter, measured in micrometers (referred to as microns), and average length, measured in millimeters. Essentially all fine diameter wool is produced by merino sheep or merino cross-breeds. Over 75% of the sheep in Australia (the world’s largest wool producer) are merino sheep, which are also bred in large numbers in South Africa, Argentina, and the former USSR. The softness, fineness, and lightness of fabrics are determined primarily by fiber diameter, and so the price is very sensitive to the mean diameter. Raw wool from sheep contains other constituents considered contaminants by wool processors. These can vary in content according to breed, nutrition, environment, and position of the wool on the sheep. The main contaminants are a solvent-soluble fraction (wool grease); protein material; a water-soluble fraction (largely perspiration salts, collectively termed suint); dirt; and vegetable matter (eg, burrs and seeds from pastures). Wool is usually harvested from sheep by annual shearing. The fiber length is, therefore, determined largely by the rate of growth, which in turn depends on both genetic and environmental factors. 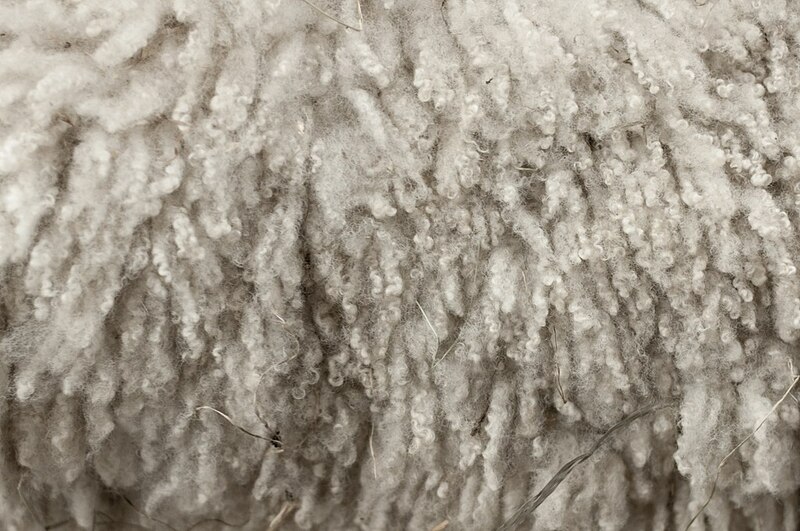 Typical merino fibers are 50–125 mm long. They have irregular crimp (curvature), with the finer fiber generally showing lower growth rates and higher crimp. The fiber surface is rough as a consequence of the outer layer of overlapping cuticle cells. By far the most important dimension is the fiber diameter. Wool fibers exhibit a range of diameters, which like fiber length is dependent on both genetics and environment. Coarse wool fibers (25–70 micrometers) are used in carpets, while fine merino fibers (10–25 micrometers) are used in apparel because of their soft handle. Wool is hygroscopic and able to absorb and desorb large amounts of water as the relative humidity surrounding the fiber changes. In textiles, the amount of water absorbed is generally expressed as a percentage of the dry weight. This is referred to as regain; and is different to water content, which is the mass of water in the fiber expressed as a percentage of the total mass of fiber plus water. A pronounced hysteresis is observed in the water sorption isotherm of wool. This is 2% higher on desorption than on absorption, at most relative humidity. The saturated regain of wool is about 33%, which is higher than that of most other fibers. TM) utilizes the moisture-buffering properties of wool. During the dyeing and finishing of wool, no melting of the fiber occurs. Care should be taken, however, when processing blends of wool and synthetic fibers that require higher temperatures. The tensile properties of wool are quite variable but, typically, at 65% RH and 208C individual fibers have a tenacity of 110–140 N/ktex (140–180 MPa), breaking elongation of 30–40% and an initial modulus of 2100–3000 N/ktex (2.7–3.9 GPa). The conversion of raw wool into a textile fabric or garment involves a long series of separate processes. There are two main processing systems, worsted, and woolen. A significant volume of wool is also processed on the semi-worsted system, for carpet use. Some wool is processed on the short-staple (cotton) system. Woolen spinning is the mechanized form of the traditional system. The first stage in wool processing is to remove the fieece impurities by scouring. The impurities consist principally of wool wax, dirt, proteinaceous contaminants, and suint. Scouring is carried out by washing the raw wool in an aqueous medium, a solvent medium, or a combination of the two. Aqueous scouring is used to process 99% of the world’s wool. This involves washing the raw wool in aqueous solutions (neutral or slightly alkaline) of nonionic detergent or, less frequently, soap and alkali. This is followed by rinsing in water. In most situations, wastewater discharged from a scouring machine contains large quantities of wool wax and both water-soluble and water-insoluble material (organic and inorganic). The pollution load of a single modern scouring machine is equivalent to a population of 50,000 people. Disposal or treatment of the wastes to comply with environmental requirements is expensive. The wool is dried after scouring and blended before carding. Carding individualizes the entangled fibers and reassembles them into a sliver weighing about 25 g/m. At the same time, up to 90% of the vegetable matter (VM) is removed. Lubrication is used to minimize fiber breakage. After carding, there are three stages of gilling, to align fibers and remove hooked fiber ends before combing. Long-staple ring spinning is similar to short-staple (cotton) ring spinning, except that the components are increased in approximate proportion to the length of the fibers. On the spinning frame, the rovings are drafted by a factor of about 20, the twist is inserted, and at the same time, the yarn is wound onto bobbins. The yarn on the bobbins is usually steam-set in an autoclave to reduce its twist liveliness, then wound onto packages or cones. Detection and removal of thick, thin and colored faults can occur during winding. Twisting resulting in a two-fold yarn and further setting, the yarns are ready for knitting or weaving. Open-end (rotor) spinning is rarely used for wool and spinning and twisting are very costly operations, because of their low productivity: typically 40 spindles produce 1 kg/h of yarn. impart dimensional stability and to confer the required handle. Finally, garments are set by steam pressing to form their desired shape, for example, to insert pleats and creases. a stretched state (for example by line drying). of relaxation shrinkage requires careful control during fabric finishing. Felting of loose fibers results in entanglement, whereas in fabrics fiber migration inside and between yarns reduces the fabric area, ie, shrinkage occurs. The term shrink-resistant is preferred to shrink-proofed, although in recent years emphasis has switched to performance-related terms, such as hand-washable and machine-washable. A recent trend is to use the term easy-care, which for knitwear means resistance to felting shrinkage under severe conditions, including tumble drying. It also includes assessment of the fabric appearance after testing. For woven garments, this includes retention of pleats or creases as well as smooth drying performance. Alpaca: The Alpaca (Vicugna pacos) is a domesticated South American camelid species whose wild ancestor is the vicuña. Llama: The llama (Lama glama) is the other domesticated South American camelid species, its wild ancestor being the guanaco. Vicuña: The vicuña (Vicugna vicugna) is the smaller of the two wild South American camelids and its undercoat fibers are extremely valuable and “special”, not only for its textile characteristics but also for its rareness and association to exotic environments and culture. Guanaco: The guanaco (Lama guanicoe) is the biggest of the two wild South American camelid species and its population is much larger than that of the Vicuña. Mohair: Angora goats from northwest of Argentina’s Patagonia produce mohair of competitive quality.